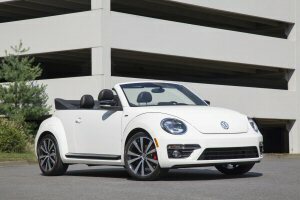 In 2011, The Beetle returned to Canada in its current form. Changes from the previous model were quite noticeable. Longer, lower and wider, The Beetle brought with it a much more aggressive attitude than did its predecessor. For the 2014 model year, Volkswagen has taken this aggression one step further with the introduction of the "R-Line" package. Making its first public appearance at the Montréal Autoshow, the package is available on Beetles outfitted in Sportline trim. Included are a number of interior and exterior enhancements designed to showcase a bolder character. Outside, 19" "Tornado" alloy wheels do an outstanding job of filling the wheelwells, while bi-Xenon headlights with LED daytime running lights pierce the darkness with a distinct flair. Front and rear bumpers provide not only an aggressive stance, but also aid in aerodynamics. Inside, the dashboard now features Vanadium Grey trim, and the door sills are custom-designed in aluminum. R-Line badging inside and outside make sure passersby know what they are looking at. The R-Line package is now available to order on The Beetle sedan and The Beetle Convertible models. Founded in 1952, Volkswagen Canada is headquartered in Ajax, Ontario. It is the largest volume European automotive nameplate in Canada, and sells the Golf, Golf Wagon, Golf GTI, The Beetle, Jetta, Eos, Passat, CC, Tiguan, and Touareg through 136 independent Canadian Dealers. It is the leader in affordable TDI Clean Diesel vehicle sales in Canada, and forms part of Volkswagen Group Canada Inc., a subsidiary of Volkswagen AG headquartered in Wolfsburg, Germany.